The Bush administration will propose a new plan to open up national forests to more logging, confirming a draft plan published two weeks ago, The Associated Press has learned. Under the plan, to be announced by Agriculture Secretary Ann Veneman on Monday, governors would have to petition the federal government to block road-building in remote areas of national forests, replacing a national rule against such projects adopted by the Clinton administration. 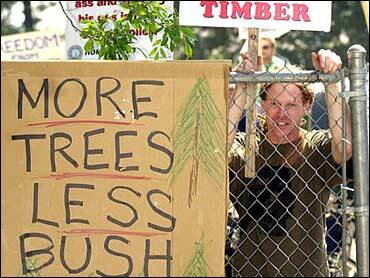 The Bush administration for nearly two years has been weighing changes to the so-called roadless rule, which blocks road construction in nearly one-third of national forests as a way to prevent logging and other commercial activity. Officials call the new roadless policy a commonsense plan that protects backcountry woods while advancing a partnership with the nations governors, particularly in the West. Veneman, whose department includes the Forest Service, was to announce the policy at the Idaho Capitol in Boise with Gov. Dirk Kempthorne and Sen. Larry Craig, both Republicans. "Our actions today advance President Bush's commitment to cooperatively conserving roadless areas on national forests," Veneman said in remarks prepared for the event. "The prospect of endless lawsuits represents neither progress, nor certainty for communities. As part of the plan, the administration said it will reinstate for 18 months an interim rule requiring that Forest Service Chief Dale Bosworth approve any new road construction in previously protected areas. The administration had let the interim rule lapse last year as it considered a permanent rule to replace the Clinton-era policy. Environmentalists howled when the draft rule was made public earlier this month. Without a national policy against road construction, they said, forest management will revert to individual forest plans that in many cases allow roads and other development on most of the 58 million acres now protected by the roadless rule. Environmentalists say it is unlikely that governors in pro-logging states such as Idaho, Wyoming, Montana and Utah will seek to keep the roadless rule in effect. Kempthorne is among several Republican governors in the West who have strongly criticized the rule, calling it an unnecessary restriction that has locked up millions of acres from logging and other economic development. Citing such complaints, the Bush administration said last year it would develop a plan to allow governors to seek exemptions from the roadless rule. The latest plan turns that on its head by requiring governors to petition the Agriculture Department if they want to protect against timbering in their state. The Clinton administration adopted the roadless rule during its final days in office in January 2001, calling it an important protection for backcountry forests. Environmentalists hailed that action, but the timber industry and some Republican lawmakers have criticized it as overly intrusive and even dangerous, saying it has left millions of acres exposed to catastrophic wildfires. Federal judges have twice struck down the 3-year-old rule, most recently in a Wyoming case decided in July 2003. That case, which environmentalists have appealed, is one of several pending legal challenges, complicating efforts to issue a new plan. The new plan will be published in the Federal Register this week, with a 60-day comment period extending into September.